Rene Umberger, For The Fishes’s founder and current Executive Director, works full time to provide leadership to For The Fishes and to all elements of the organization’s activities. In 2010, she spearheaded the passage of two Maui County wildlife protection initiatives that established the strongest protections yet in Hawaii. For more than six years, she has served as a consultant to the Humane Society of the United States and Humane Society International on coral reef wildlife issues. 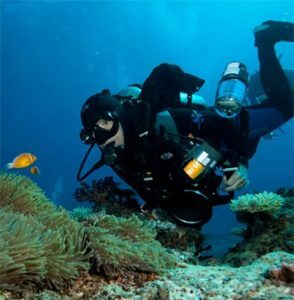 A SCUBA instructor, Umberger understands intimately the risks to wildlife and coral habitats, having made over 10,000 dives throughout the Indo-Pacific. In 2012, Umberger conceptualized Tank Watch, a creative mobile application to improve public awareness about the important differences between captive-bred and wild-caught fish in personal and public aquariums. She secured Aysling, a pro bono sponsor for the design and development costs of the app, valued at $30,000. Tank Watch came to life in September 2014 when it was launched for Apple. The Android version launched in 2016. To date, over 11,000 people have downloaded Tank Watch. Working with Dr. Craig Downs of Haereticus Environmental Laboratory, Umberger has been assessing the prevalence of cyanide-caught fish in the U.S. MAT. This work is slated for publication in mid-2017. Dr Lynn Allen: Dr. Allen has been passionate about the ocean for more than 55 years. She moved to Hawaii from California in 1995, became a SCUBA instructor and underwater photographer. She has made over 3,000 dives photographing wildlife on coral reefs throughout the Indo-Pacific. She earned a PhD in tumor cell biology from the University of Southern California before working in the biomedical field. Her expertise in academic medical research and development, knowledge of cellular biology and dive experience are key components of For The Fishes’s growth and success in such a short time. Mark Schacht: Mr. Schacht is a dive master and accomplished underwater videographer. In 2015, he developed a video survey that documented the unprecedented coral bleaching that occurred in Hawaii’s reefs that year. He brings legislative savvy to the For The Fishes Board through his position as the Deputy Director and Legislative Director of the California Rural Legal Assistance Foundation. Dr. Brooke Porter: Dr. Porter is a consultant to research entities with specific emphasis on marine conservation and development projects in under-developed countries. She serves as a Scientific Advisor for Coral Triangle Conservancy in the Philippines and has experience as a peer reviewer for multiple professional journals. Her research interests bring crucial expertise and knowledge to For The Fishes. They include the human dimensions of the marine environment, emphasizing coastal and marine tourism, and work with international marine conservation collaborations, aide agencies and educational institutions. Linda Wright: Ms. Wright divides her time between New Zealand and San Francisco. In New Zealand, she is semi-retired and building a home. In San Francisco, she runs a business restoring antique furniture. Her superb planning skills and keen attention to detail, provides a critical contribution to all that For The Fishes accomplishes.